Mutie, Jeremiah. Death in Second-Century Christian Thought: The Meaning of Death in Earliest Christianity (Eugene: Pickwick Publications, 2015), 244pp. Among proponents of the heresy of annihilationism, one often comes across two contradictory claims regarding the early church. On the one hand, those who seek to establish their view in the early church will claim that the earliest church fathers were all annihilationists/conditional immortalitists. The introduction of concepts like the immortality of the soul, the intermediate state, and hell as everlasting conscious torment, they will go on to claim, came after the church began to be influenced by pagan Greek philosophy. On the other hand, there are others who claim that the church fathers, even as early as Justin Martyr, corrupted the pure teaching of the Bible by mixing in ideas from pagan Greek philosophy. While the reductionist approach to the church’s early post-apostolic days can support any view one likes — this is, after all, the approach taken by the Roman Catholic apologists, Jehovah’s Witnesses, Seventh Day Adventists, and even the Mormons who share virtually nothing in common theologically — it does not withstand scrutiny. A reading of the texts from that time reveals that there was not only a diversity of beliefs regarding the immortality of the soul among the Greek philosophers, but nuances of articulation that set the Christian fathers apart from both the Orphic and Platonic immortalists and the Stoic and Epicurean annihilationists of their time. If one has the time to devote to doing their own detailed research of the writers of this time, in other words, it would be evident to him that the church fathers did not deny the immortality of the soul, nor did they believe in Plato’s version of the doctrine. Instead, they carefully selected philosophical terminology and concepts, reworking them to express what they believed the Scriptures clearly taught about death, salvation, resurrection, and damnation. Since such a study requires time and resources many do not have, a scholarly but readable book on the subject is best suited to their needs. Among the few written exclusively about these issues, Jeremiah Mutie’s Death in Second-Century Christian Thought: The Meaning of Death in Earliest Christianity is an invaluable resource. Mutie carefully examines the socio-historical context of the early church fathers, comparing their views of death and the afterlife to those articulated within the overarching culture in which they found themselves, thereby clarifying the relationship between the earlier and later church fathers examined whose language about death, the intermediate state, and resurrection may seem to be at odds, prima facie. Mutie shows that the church did not immediately apostatize by mixing Plato and the Scriptures together, nor did the church gradually apostatize by mixing Plato and the Scriptures together, but she progressed over time in her understanding of death, the intermediate state, and the resurrection. As socio-historical environments changed, so too did the circumstances, attendant necessary emphases in theological/apologetical and pastoral needs, and time requisite to articulating the teaching of the Scriptures regarding these subjects. What others have explained to be a complete surrender to Plato, or a complete rejection of any ideas even vaguely similar to those of Plato is shown to be neither. The church fathers were not pagan Greek philosophers; they were devoted Christian brothers who sought to be biblically faithful in doctrine and practice, the latter concern often leading them to employ terminology and concepts in a uniquely Christian way. 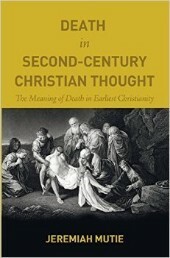 Death in Second-Century Christian Thought is a substantial study demonstrating that although the church fathers were terminologically influenced by their Greek philosopher-neighbors, and although they sometimes employed concepts from their surrounding cultures in uniquely Christian ways, their ultimate authority in matters of doctrine and practice was the Word of God. Thus, their beliefs surrounding personal and general eschatology, under which headings are subsumed questions regarding the soul’s mortality or immortality, find their roots in careful study of the Scriptures articulated through culturally pregnant terminology repurposed for the purposes of apologetics, preaching, and pastoral care.